This article is about animals that are difficult to detect. For the genus of grasses, see Crypsis (genus). For animals whose existence is not scientifically recognized, see Cryptid. In ecology, crypsis is the ability of an animal to avoid observation or detection by other animals. It may be a predation strategy or an antipredator adaptation. Methods include camouflage, nocturnality, subterranean lifestyle, and mimicry. Crypsis can involve visual, olfactory (with pheromones), or auditory concealment. 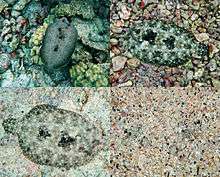 When it is visual, the term cryptic coloration, effectively a synonym for animal camouflage,[lower-alpha 1] is sometimes used, but many different methods of camouflage are employed by animals. There is a strong evolutionary pressure for animals to blend into their environment or conceal their shape, for prey animals to avoid predators and for predators to be able to avoid detection by prey. Exceptions include large herbivores without natural enemies, brilliantly-colored birds that rely on flight to escape predators, and venomous or otherwise powerfully armed animals with warning coloration. Cryptic animals include the tawny frogmouth (feather patterning resembles bark), the tuatara (hides in burrows all day; nocturnal), some jellyfish (transparent), the leafy sea dragon, and the flounder (covers itself in sediment). Methods of crypsis include (visual) camouflage, nocturnality, and subterranean lifestyle. Camouflage involves a variety of methods, from disruptive coloration to transparency and some forms of mimicry. As a strategy, crypsis is used by predators against prey and by prey against predators. Crypsis also applies to eggs and pheromone production. Crypsis can in principle involve visual, olfactory, or auditory camouflage. Camouflage allows animals like this disruptively-patterned spider to capture prey more easily. Many animals have evolved so that they visually resemble their surroundings by using some sort of natural camouflage that may match the color and texture of the surroundings (cryptic coloration) and/or break up the visual outline of the animal itself (disruptive coloration). Such animals may resemble rocks, sand, twigs, leaves, and even bird droppings (mimesis). Some animals change color in changing environments seasonally, as in ermine and snowshoe hare, or far more rapidly with chromatophores in their integuments, as in chameleon and cephalopods such as squid. Countershading, the use of different colors on upper and lower surfaces in graduating tones from a light belly to a darker back, is common in the sea and on land. It is sometimes called Thayer's law, after the American artist Abbott Handerson Thayer, who published a paper on the form in 1896 that explained that countershading paints out shadows to make solid objects appear flat, reversing the way that artists use paint to make flat paintings contain solid objects. Where the background is brighter than is possible even with white pigment, counter-illumination in marine animals, such as squid, can use light to match the background. Some animals actively camouflage themselves with local materials. The decorator crabs attach plants, animals, small stones, or shell fragments to their carapaces to provide camouflage that matches the local environment. Some species preferentially select stinging animals such as sea anemones or noxious plants, benefiting from aposematism as well as or instead of crypsis. Some animals, in both terrestrial and aquatic environments, appear to camouflage their odor, which might otherwise attract predators. 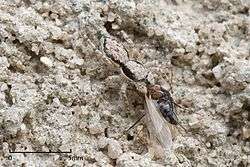 Numerous arthropods, both insects and spiders, mimic ants, whether to avoid predation, to hunt ants, or (for example in the Large blue butterfly caterpillar) to trick the ants into feeding them. Pirate perch (Aphredoderus sayanus) may exhibit chemical crypsis, making them undetectable to frogs and insects colonizing ponds. Some insects, notably some Noctuid moths (such as the Large Yellow Underwing) and some tiger moths (such as the Garden Tiger), were originally theorized to defend themselves against predation by echolocating bats, both by passively absorbing sound with soft, fur-like body coverings and by actively creating sounds to mimic echoes from other locations or objects (a "phantom echo" that might therefore represent "auditory crypsis"), with alternative theories about interfering with the bats' echolocation ("jamming"). Subsequent research has provided evidence for only two functions of moth sounds, neither of which involve "auditory crypsis:" tiger moth species appear to cluster into two distinct groups: one type produces sounds as acoustic aposematism (warning the bats that the moths are unpalatable) or are acoustic mimics of unpalatable moths, and another type that uses sonar jamming. In the latter type of moth, detailed analyses failed to support a "phantom echo" mechanism underlying sonar jamming but instead pointed towards echo interference. There is often a self-perpetuating co-evolution, or evolutionary arms race, between the perceptive abilities of animals attempting to detect the cryptic animal and the cryptic characteristics of the hiding species. Different aspects of crypsis and sensory abilities may be more or less pronounced in given predator-prey species pairs. Zoologists need special methods to study cryptic animals, including biotelemetry techniques such as radio tracking, mark and recapture, and enclosures or exclosures. 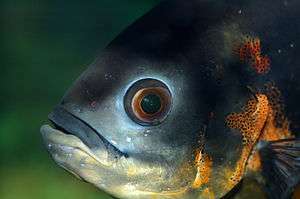 Cryptic animals tend to be overlooked in studies of biodiversity and ecological risk assessment. The coloration of the leaf-nosed viper (Eristicophis macmahonii) blends with sand. This frog facing right, to the upper left of the stick in the rightmost third of the photo, is nearly invisible among dead leaves. 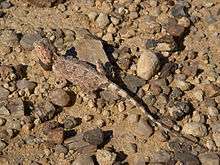 Stenodactylus sthenodactylus matches the background of the Judean desert. A common snakeneck turtle covered in camouflaging algae; when resting this animal looks like an alga-covered rock. Arctiid moths like the Garden Tiger, Arctia caja, have furry bodies to absorb sound, and make clicks that may jam bat echolocation. ↑ Military camouflage has multiple purposes, including not only concealment but also esprit de corps and recognition of friend and foe. 1 2 Zuanon, J.; I. Sazima (2006). "The almost invisible league: crypsis and association between minute fishes and shrimps as a possible defence against visually hunting predators". Neotropical Ichthyology. 4 (2): 219–214. doi:10.1590/S1679-62252006000100012. ↑ Allaby, Michael (2014). Crypsis. A Dictionary of Zoology (4th ed.). Oxford University Press. ↑ Allaby, Michael (2015). Crypsis. A Dictionary of Ecology (5th ed.). Oxford University Press. ↑ Nguyen, L. P.; et al. (2007). "Using digital photographs to evaluate the effectiveness of plover egg crypsis". Journal of Wildlife Management. 71 (6): 2084–2089. doi:10.2193/2006-471. ↑ Raffa, K. R.; et al. (2007). "Can chemical communication be cryptic? Adaptations by herbivores to natural enemies exploiting prey semiochemistry". Oecologia. 153 (4): 1009–1019. doi:10.1007/s00442-007-0786-z. PMID 17618465. ↑ "Definition of Crypsis". Amateur Entomologists' Society. Retrieved August 19, 2012. ↑ "All Lives Transform:Adaptation- Mimicry". Morning-earth.org. February 14, 2007. Retrieved January 5, 2012. ↑ Donisthorpe, Horace (January 1922). Mimicry of Ants by Other Arthropods. Transactions of the Royal Entomological Society of London. 69, Issue 3–4. pp. 307–311. ↑ Resetarits, Jr., William J.; Binckley, Christopher A. (2013). "Is the pirate really a ghost? Evidence for generalized chemical camouflage in an aquatic predator, pirate perch Aphredoderus sayanus" (PDF). The American Naturalist. 181 (5): 690–699. doi:10.1086/670016. Archived from the original (PDF) on May 31, 2013. ↑ Miller, Lee A.; Surlykke, Annemarie (July 2001). "How Some Insects Detect and Avoid Being Eaten by Bats: Tactics and Countertactics of Prey and Predator" (PDF). BioScience. 51 (7): 570–581. doi:10.1641/0006-3568(2001)051[0570:HSIDAA]2.0.CO;2. ↑ Griffin, Donald R. (July 2001). "Full Access Return to the Magic Well: Echolocation Behavior of Bats and Responses of Insect Prey". BioScience. 51 (7): 555–556. doi:10.1641/0006-3568(2001)051[0555:RTTMWE]2.0.CO;2. JSTOR 10.1641/0006-3568%282001%29051%5B0555%3ARTTMWE%5D2.0.CO%3B2. ↑ N.I. Hristov, W.E. Conner. 2005. Sound strategy: acoustic aposematism in the bat–tiger moth arms race. Naturwissenschaften 92: 164–169. ↑ J.R. Barber, W.E. Conner. 2007. Acoustic mimicry in a predator–prey interaction. Proceedings of the National Academy of Sciences 104:9331–9334. ↑ A.J. Corcoran, W.E. Conner, J.R. Barber. 2010. Anti-bat tiger moth sounds: Form and function. Current Zoology 56 (3): 358–369. ↑ Amazonia Org. "Amazonia". Amazonia.org. Retrieved August 21, 2012. Wikimedia Commons has media related to Crypsis. Caterpillar that resembles bird droppings on leaves.